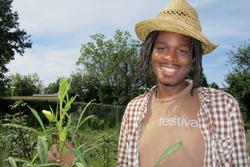 At Farm School NYC, he found a powerful teaching tool in the Training the Trainer model. His students’ life experience and their willingness to engage with the material are essential to moving the larger project forward, he finds. “The more I use this model, the more I appreciate the experience of teaching and being taught,” he says. Based in Philadelphia, Chris gets a different perspective on urban agriculture from teaching in New York, while his students learn from him about urban farming in Philly.